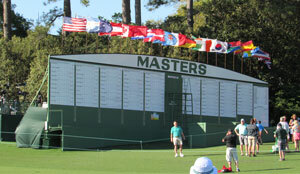 *Cameras (still photography/personal use only) are allowed at practice rounds on Monday, Tuesday and Wednesday. Violation of these policies will subject the ticket holder to removal from the grounds and the ticket purchaser to the permanent loss of credentials. 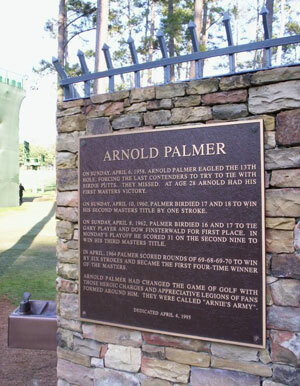 Autograph seeking is only allowed around the practice range and on the Par 3 course during the Par 3 Contest. 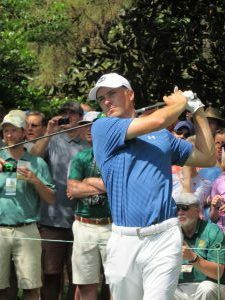 A No Autograph Policy will be enforced on the golf course for practice and tournament days. Patron tickets will be limited to a total of three entries per day. 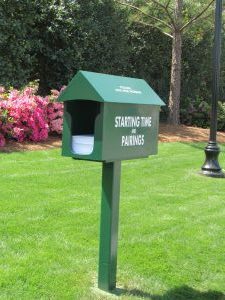 Free Masters parking is available at Augusta National Golf Club on a first-come, first-serve basis. Chairman of Augusta National Golf Club and Masters Tournament Fred Ridley stands with overall division winners, from left, Ella June Hannant, Taighan Chea, Vanessa Borovilos, Tip Price, Sarah Im, P.J. Maybank, Katherine Schuster, and Brendan Valdes at the presentation ceremony during the Drive, Chip and Putt National Finals at Augusta National Golf Club, Sunday, April 1, 2018. Repeat competitors found plenty of success at the fifth annual Drive, Chip & Putt National Finals. 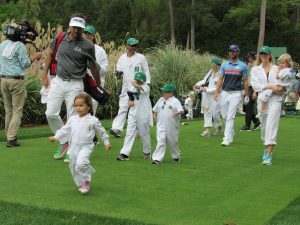 Experience often is a valuable teacher, much to the delight of some of the participants in last year’s Drive, Chip and Putt National Finals at Augusta National Golf Club. Three of the eight 2018 champions had competed in the event in prior years. Conducted by the Masters Tournament, the PGA of America and the USGA, the championship is a free, nationwide youth golf development program for boys and girls, ages 7-15, in four age categories. Tens of thousands of youths compete in the annual event, which began in 2014. 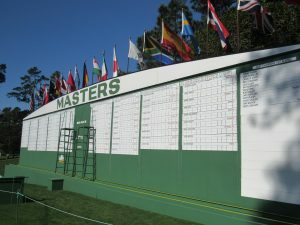 The field is narrowed down to 80 competitors who earn a trip to the finals, which are held each year at Augusta National Golf Club on the Sunday preceding the Masters. 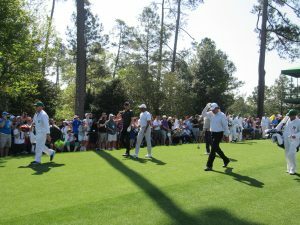 Chip Winner Vanessa Borovilos, Girls, 10-11 age group, is picked up by Masters champion Gary Player of South Africa as Masters champion Trevor Immelman of South Africa looks on during the Drive, Chip and Putt National Finals at Augusta National Golf Club, Sunday, April 1, 2018. The third time was the charm for Vanessa Borovilos of Toronto, Ontario. The winner of the Girls 10 – 11 division also competed in the Girls 7 – 9 division of the Drive Chip and Putt finals in 2015 and 2016, finishing in fourth and fifth place, respectively. 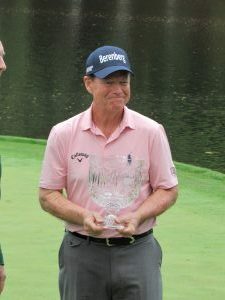 “I’ve tried a lot of times (to win Drive, Chip and Putt), and (last) year I just practiced more and I think that helped me,” said Vanessa, who was lifted off her feet by former Masters champion Gary Player during the trophy presentation ceremony. On her second trip to the Drive, Chip and Putt finals, Katherine Schuster of Kill Devil Hills, North Carolina won the Girls 14 – 15 division. She finished in third place in the 2015 national finals in the Girls 10 – 11 division and was a medalist in putting. 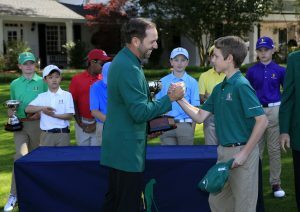 Tip Price, Boys, 10-11 age group, is congratulated by Masters champion Sergio Garcia of Spain with First Place Overall trophy during the Drive, Chip and Putt National Finals at Augusta National Golf Club, Sunday, April 1, 2018. Cheboyogan, Michigan’s PJ Maybank III, who competed in the 2015 Drive, Chip and Putt National Finals in the Boys 7 – 9 division, drew on his experience to win the Boys 12 -13 division. “I knew what to expect. 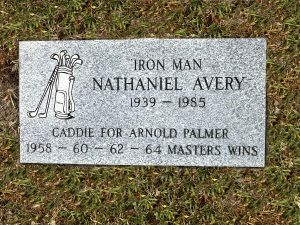 I knew which way the putts would break and how the chip would roll out,” he said. He had to hold off a late rally by Conrad Chisman of Stanwood, Washington. Chisman became the first finalist in the history of the competition to make both putts on the 18th green. Brendan Valdes of Orlando, Florida, who claimed the Boys 14 -15 division title, felt a surge of pride when he saw his name go up on the leader board with those of the other winners. “That’s where all the leaders have been, and it’s where Sergio Garcia was (in 2017). 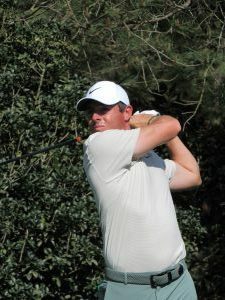 It’s just insane that I am up there,” said Brendan, who defeated Joshua Lavely of Kewadin, Michigan in a playoff for the victory. The other female champions were Ella June Hannant of Pikeville, North Carolina (ages 7 – 9) and Sara Im of Duluth, Georgia (ages 12 – 13). The other male winners were Taighan Chea of Bothell, Washington (ages 7 – 9) and Tip Price of Greenville, South Carolina (ages 10 – 11). 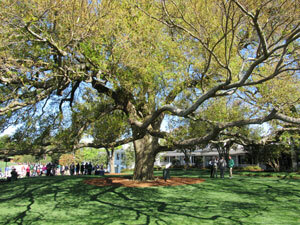 This year’s Drive, Chip and Putt Championship will be held at Augusta National on Sunday, April 7. Registration for the 2019 championship is underway at drivechipandputt.com, and local qualifiers begin in May. 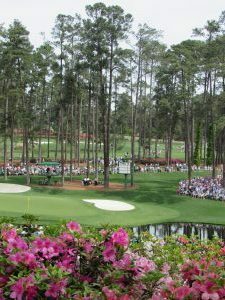 Masters Tournament patrons have a real appreciation for Augusta National Golf Club, so we decided to ask them to tell us about some of their favorite things on and off the golf course. 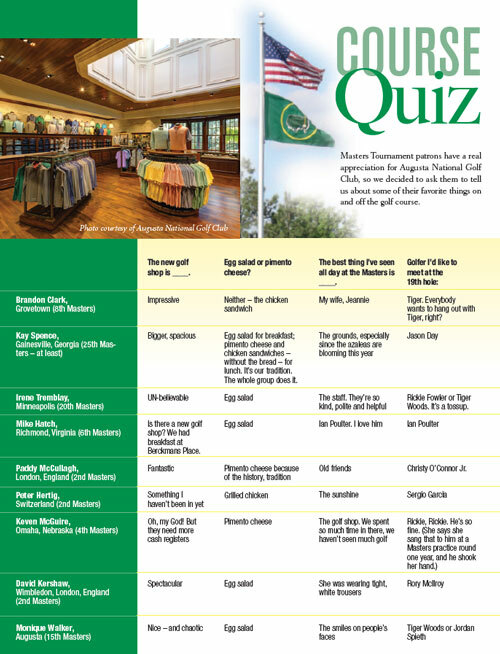 Published on March 25, 2019 in Guide to The Masters and tagged none by Kristy Johnson. Weekly farmers market returns with local produce, artisanal goods and new surprises. The weather is getting warmer, and the days are getting longer. Sounds like the perfect ingredients to launch the Columbia County Farmers Market. Beginning on March 7, the Farmers Market will be held at Evans Towne Center Park from 4 p.m. until 8 p.m. every Thursday through October 24. Each week local residents can browse vendors’ stands for goods such as locally grown produce, meats, dairy products, honey, jams and jellies, pickled foods, soaps and candles. Market-goers can pick up menu ideas that showcase locally grown products, and a food truck will be onsite each evening of the market. 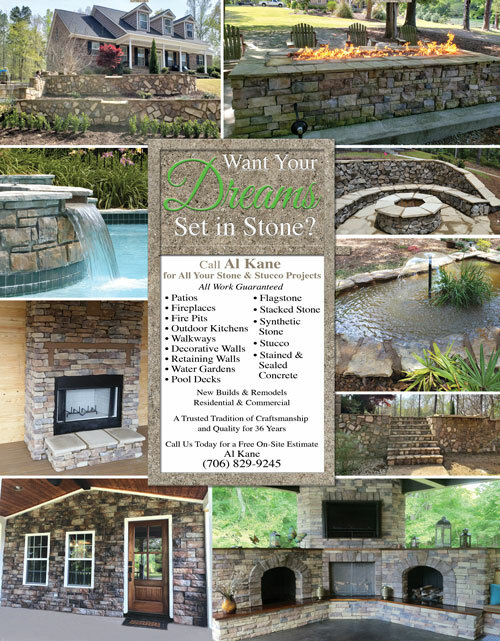 Entertainment will include live music and a kids’ fun zone. On the first Thursday of each month, a beer and wine tent, along with a Make It at the Market activity, will be offered. The cost of making the craft will vary according to the project. The market is designed to give residents “a reason to bring the family out and enjoy the park once a week,” says Cassidy Harris, the county public relations manager. The fun will continue at the park March 9 from 5 p.m. until 9 p.m. with the county’s “Saturday Cinema” free movie night. A food truck, kids’ fun zone and more will be available as well. Published on February 28, 2019 in Garden Scene and tagged none by Kristy Johnson. 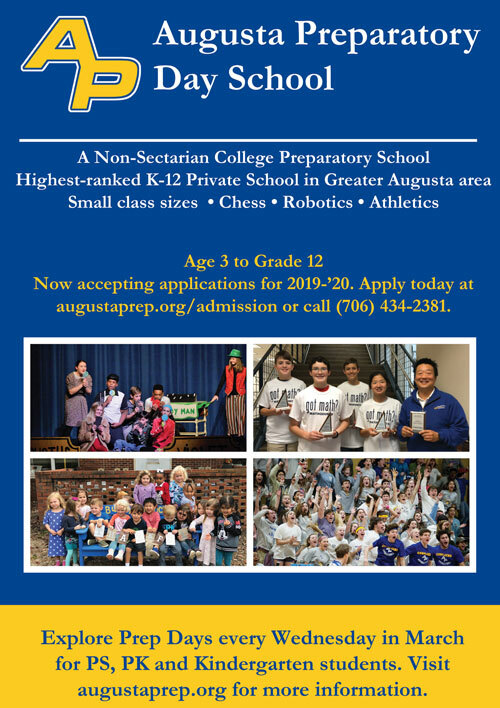 Published on February 28, 2019 in Education Options and tagged none by Kristy Johnson. A local businessman and a globetrotting explorer team up to share the wonders of the planet with others. When life experiences don’t quite measure up to expectations, world-class explorer Richard Wiese has a word for that – anticipointment. Fortunately, however, Wiese, host and executive producer of the PBS TV program “Born to Explore,” also has the perfect remedy for these circumstances. He crisscrosses the globe to celebrate its diverse cultures, natural wonders and wildlife on his award-winning show, bringing his audience along for the ride. One of the people he has met through his travels is local businessman Wayne Brown, who owns Aggressor Adventures. The Augusta-based business takes travelers on scuba diving, river cruise and safari lodge adventure vacations. Indeed, they were. In fact, two upcoming 30-minute episodes of “Born to Explore” were part of trips that Wiese took with Aggressor Adventures, a sponsor of the show. 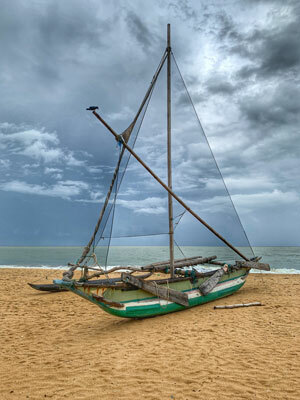 The March 23 episode was shot in the Cayman Islands, and the March 30 program was filmed in Sri Lanka. Wiese joined Brown at a viewing party of the two shows for friends and family at Riverwatch Cinemas in February. 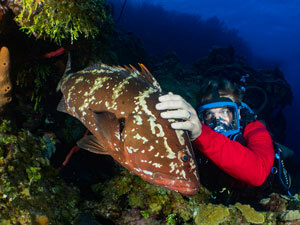 In the Cayman Islands, Wiese went on a scuba diving expedition on one of the newest liveaboards in Brown’s fleet, the four-deck, 135-foot-long Cayman Aggressor V.
Descending deep in the turquoise waters of the western Caribbean Sea, the cameras follow Wiese as he takes his first wall dive, explores shipwrecks and pets Lucy, an amiable Nassau grouper. 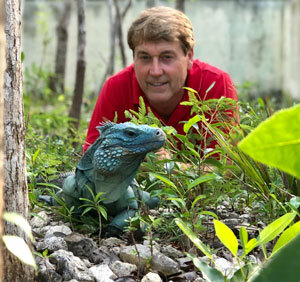 On island terra firma, he gets shoulder-to-shoulder with blue iguanas – the most endangered iguanas on Earth. 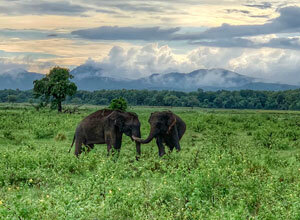 The Sri Lanka journey highlights Wiese’s adventure to the Aggressor Safari Lodge near the Wilpattu and Minneriya National Parks. 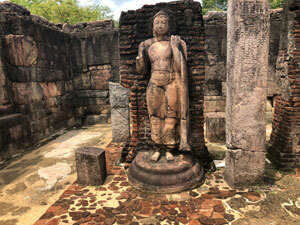 Viewers can tag along with Wiese as he explores the cultural history of the Buddhist nation, takes a jungle excursion to Monkey Kingdom to observe the primates in their natural habitat and goes on Jeep safaris in search of leopards, sloth bears, water buffalo and Asian elephants. “I’ve been on African safaris dozens of times, but the most elephants I’ve ever seen in my life were in Sri Lanka,” says Wiese. He calls the country a “beautiful place to visit” and “the next hot spot,” and those sentiments are just the words that Brown likes to hear. Wiese says his TV show has a dual purpose – to create positive cultural understandings of people around the world and to foster an appreciation of wildlife and nature that highlights the importance of good stewardship. He must be doing something right. Premiering in 2011, “Born to Explore” has earned 13 Daytime Emmy nominations, two Daytime Emmy awards, 34 Telly awards, four Parents’ Choice awards and a CINE Golden Eagle. Wiese also has won numerous accolades including the 2012 Walter Cronkite Award for his contributions to journalism and exploration. For Brown and Wiese, their passion for exploration and adventure began when they were young boys. 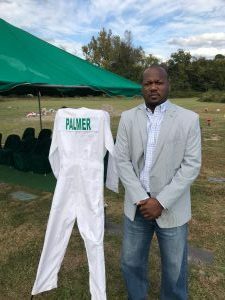 Brown has been scuba diving since the late 1990s, taking up the sport when his son was 15 years old so they would have something to do together. He took Aggressor diving trips to the Galapagos Islands and Belize before he bought the company in 2007. As a boy Wiese played with his dogs on the Stony Brook mudflats of his native Long Island. When he was 11 years old, he climbed Mt. Kilimanjaro with his father. From cross-country skiing to the North Pole to leading expeditions to Australia’s Northern Territory, he has been exploring the planet ever since. He is president of The Explorers Club, an international professional society founded in 1904 to promote the scientific exploration of land, sea, air and space. He has served as president of the organization since 2002, when he became the youngest person to assume the position. Published on February 25, 2019 in People and tagged none by Kristy Johnson. A Grovetown couple loves to see their home improvement and refinished furniture projects – for themselves and others – come together. It all started with the round table in the corner of the living room. When Kristen Kennedy went out of town one weekend on a girls’ getaway, her husband, Eric, refinished the table to surprise her when she returned to their Grenelefe Park home. He has been refinishing furniture ever since. When she has an idea, though, she needs to be sure it’s what she wants before she mentions it to Eric, who is director of campus facilities at Stevens Creek Church and studying to be a pastor. “If I go out of town for a week, it will be done when I come home,” Kristen says. His wife is not the only person who benefits from his skills, however. Eric also has a side business called Distressed Kennedy in which he refinishes vintage furniture. People find out about his work by social media or word-of-mouth, and he posts pictures of refinished pieces on Facebook. The Kennedys’ Grovetown home, where they have lived for 3.5 years, is full of their handiwork as well. They fell in love with the neighborhood after Kristen’s parents moved there. When all of them would go to the neighborhood, which once was a horse pasture, to check on the progress of her parents’ home before they moved in, the Kennedys saw their current house on the market. 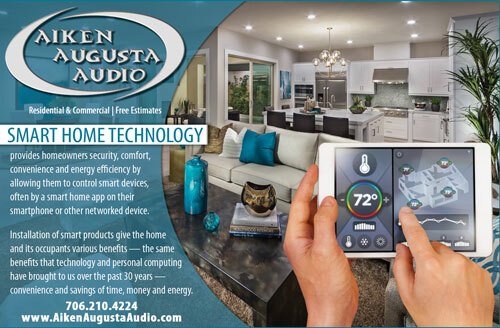 “The house was dark inside, but it had good bones,” says Kristen, a warranty and business analyst for Electrolux. With its blue siding, wood front door, thin white columns on the front porch and brick walkway, the exterior offers plenty of curb appeal. They removed the banisters from the front porch, which now features two black rockers, a black porch swing and a pair of ceiling fans. The interior of the home profited from their talents as well. The house originally had a wall between the dining room and the reading room, but the Kennedys opened up the space by putting a cutout with decorative distressed corbels in the wall. On opposite walls of the dining room, two high, square, ledged windows bring light into the space. Eric put an antique walnut stain on the wooden dining room tabletop to match the floor, and an antique gold light fixture runs parallel to the table. In the china cabinet, Kristen mixes her grandmother’s china with newer dishes. 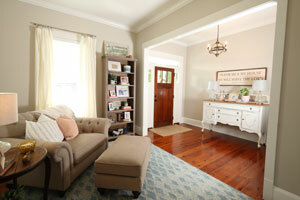 The wide foyer is home to a white chest that Eric refinished. “We bought it to sell it, but I wanted to keep it,” Kristen says. 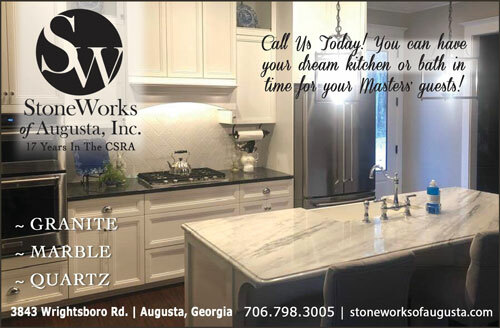 Remodeling the kitchen last summer, they changed the direction of the counters and replaced the black granite countertops with white quartz. 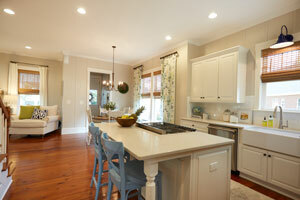 They added a pantry and a new island, and Eric and Kristen’s father installed the white subway tile backsplash. The kitchen also includes a fireclay farmhouse sink – “It’s more durable and stain-resistant,” says Kristen – and a blue light above the sink. They painted the two chairs at the island blue as well. “I like neutrals, but I added earthy tones like blues and greens and yellows,” Kristen says. They also added trim on the walls of the kitchen, which opens to the living room, to create separation between the two spaces. The microwave is hidden in the pantry, which features sliding drawers, dividers for cookie sheets and a sliding cabinet for spices. Eric painted and refinished the kitchen table and chairs, which he found by the side of a road. He also painted the high chair, which he found on an online yard sale, for their daughter, Charlee Kate. The adjoining living room features a brick gas fireplace, a flat screen TV above the stained pine mantel, a leather sectional sofa and a grouping of family photos on one wall. Eric distressed the coffee table and a round table between the fireplace and an oversized chair. The nearby powder room features a pedestal sink and shiplap walls – another surprise from Eric for Kristen after an out-of-town trip. With elements of yesteryear, the house features 10-foot ceilings. The wood flooring throughout the first floor, except for the master bedroom, is a soft pine that came from a sawmill in Virginia. Six-paneled doors also are featured throughout the interior of the house, but other doors have moved from one spot to another. For instance, the swinging, six-paned, wood door from the hallway to the kitchen originally was the back door to the house. Which meant that another door was needed for the rear of the house, and Eric found the perfect one in downtown Augusta. The back door came from a 115-year-old house that was built for employees of J.B. White, when that building was constructed downtown. The door features a large window, ornate carvings and a turnkey antique doorbell. 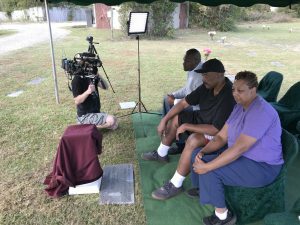 “I drove by one day and saw that the right side of the house was gone,” says Eric. He called the company that was demolishing the house and asked if he could have the door, which he refinished and painted. The bedroom furniture was their first major purchase after they got married, and an old barn gable hangs on the wall above the bed. 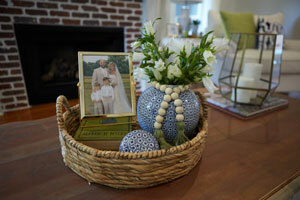 “I got the gable in a trade for refinishing a piece of furniture for someone,” says Eric. On a bedroom wall, a chicken wire bulletin board holds invitations to their rehearsal dinner and 2014 barn wedding in Appling, along with their wedding program. 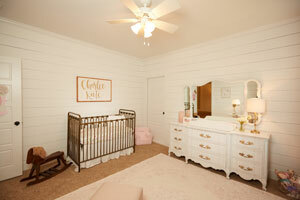 More mementoes can be found in a gold and glass keepsake box in Charlee Kate’s nursery. The box holds baby spoons that belonged to Kristen and her mom, a piece of a pink golf ball from her gender reveal party, a rattle, Kristen’s baby brush and a cross necklace that Kristen’s mother gave to Charlee Kate. Kristen’s old rocking horse is in the room, along with a stack of her childhood Golden books and a framed picture of her favorite Bible verse – Jeremiah 29:11. The nursery also feaures shiplap walls, painted bookshelves and pink and white buffalo-checked, blackout curtains. “As she gets older, we can add pieces to her bedroom furniture,” says Kristen. An added wall upstairs turned a space into another bedroom, and the Kennedys gave their backyard a makeover as well. They used to have giant hickory nut trees in the backyard, but after a day of raking, they realized they wouldn’t be able to enjoy the yard. So, they took down the trees and created an outdoor living oasis. It’s the perfect spot to grill out, roast marshmallows for s’mores over the gas fire pit and watch football games on a 65-inch, flat-screen TV mounted in a wood cabinet on the carport wall. The fenced-in outdoor living area also features Adirondack chairs around the fire pit, wicker furnishings and a round umbrella table with swivel chairs beneath a pergola. Eric planted crape myrtles, hawthorns, hydrangeas and the confederate jasmine that climbs up the columns of the pergola. 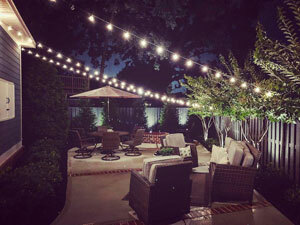 The strands of lights that are strung across the outdoor living space were part of their wedding décor. “We love it out here, especially in the fall when it’s not so hot,” Kristen says. The carport has become an extended entertainment area, and Eric uses the covered space to work his magic to refinish furniture. It’s fitting that he does his work in the open space because he can’t seem to keep his projects hidden from Kristen for long. Published on February 25, 2019 in In The Home and tagged none by Kristy Johnson. We offer amazingly low prices on quality, trusted chemicals along with spare parts and maintenance supplies for your pool!